Here’s a film by Lisa Barros D’Sa and Glenn Leyburn which presents the beauty of music, the rebellion of punk and religious diversion against the backdrop of the Troubles. 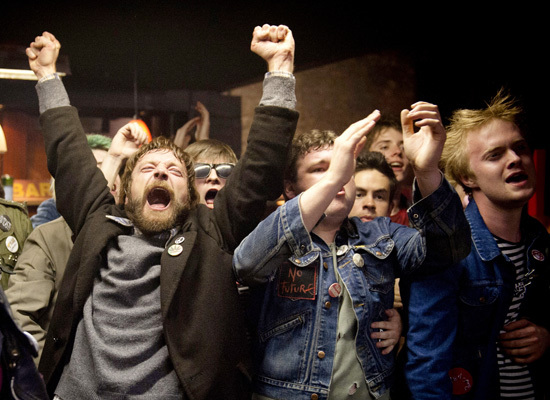 Good Vibrations is based on the true story of Terri Hooley (Richard Dormer), a restless music obsessive from Belfast. As the Troubles begin to take over his city, his friends divide and collide. He decides to open a record shop in the most bombed street in all of Belfast, naming it Good Vibrations. Originally selling reggae, blues and folk, he has an epiphany whilst watching the punk band Rudi play a small club. He becomes an unlikely leader of the punks of Northern Ireland as he creates the Good Vibrations record label, creating 7 inch records independently and bringing a once divided city back to life. The film is both astonishing and moving. This is a music film made with true heart and soul. I rarely cry watching films (with the exception of Ridley Scott’s Gladiator!) but this is a film that had me close to tears simply because of the success of getting a message across through a record, the power music has on people and the impact of a genre which brings people together no matter where you’re from, your gender or your religion. For an independent film, it’s very well made, the cinematography by Ivan McCullough and editing by Nick Emerson work well and provide the audience a sense of realism and excitement. The humour throughout is also very amusing connoting hard struggles yet also joy in promoting an independent business and a community in crisis. The performances, especially by Dormer, are convincing, implying the devotion that one has when attempting to make it big in a split city. The music is also amazing, with various Northern Irish punk bands such as Stiff Little Fingers, The Undertones and The Outcasts as the soundtrack of ‘Alternative Ulster’ during a time of hardships. This is by far the best film of 2013 I’ve seen so far and recommend any one to watch it. A beautiful film about how music touches us all weather it’s in the past or the present or the future. Perfect, classic and shear magic!